My drive to work every day is only about 10 minutes and one of the things I like to do to start my day is to get the update on what's happening in the world. 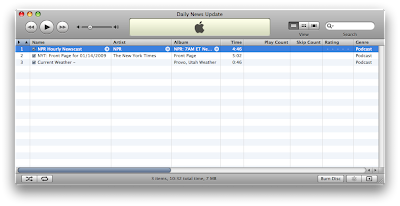 This playlist pulls a couple of daily news podcasts in every day so that all I need to do is be sure my iphone gets updated before I leave the house in order to get my news for the day. 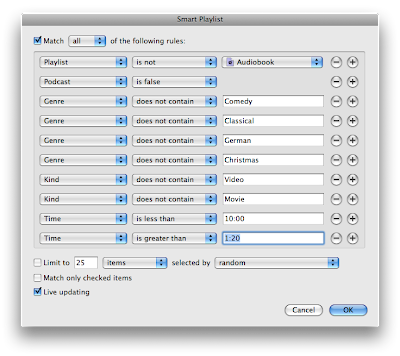 With my podcasts settings set correctly I now just need to create the smart playlist to include the names of the podcasts and be sure that the "Match ANY of the following rules" is chosen not "Match ALL". 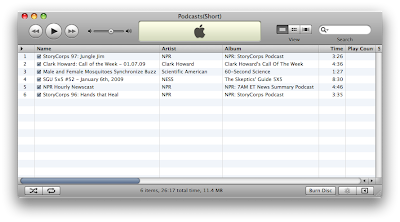 Here is what the finished playlist looks like with my three podcasts. Although I never select this playlist to actually play music from it is probably the most important one of my iTunes playlists. 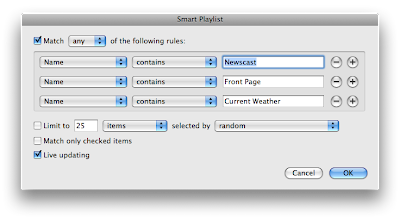 iTunes does not automatically filter out non-musical items from playlists so to make sure that a video, podcast, pdf, or anything else that isn't music doesn't show up in your playlist. This isn't exactly a playlist that you'll use to listen to, but it will come in handy when creating more advanced playlists. Almost all of my playlists will reference this Music Only playlist. There are some genre's of music in my library that I don't really like to hear during random play of my library. I filter these out on this playlist. Obviously your library will differ from mine. I have also filtered out any songs that are either really short or really long. I want these to be songs, not filler tracks. You will likely need to do a couple of tests to see if the playlist is correct, but be sure to get it right. Nobody likes a good playlist interrupted with chapter 8 of Malcolm Gladwell's latest audio book no matter how soothing his voice. This is a playlist I listen to on my way to work and back. My drive is pretty short so I want short and sweet podcasts. Mostly news and short science facts. 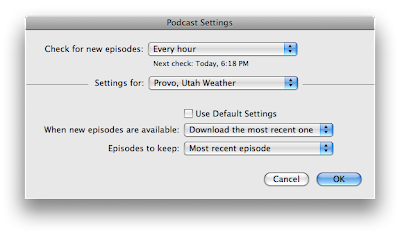 Once the podcast has been played it disappears from the playlist. Here's a shot of what my playlist looks like right now. This playlist displays your top 100 songs from 2008. A great way to make your own retrospective blog post for the year. See mine here.